Fresh Plums look so pretty sitting on top of a cake. You may think that plums, when cut in half, would dry out during baking but the opposite is true. A little sugar sprinkled on the top of the plums, along with the heat from the oven, causes the plums to soften and their juices to be released. So by the end of the baking time they have become wonderfully soft and almost jam-like with nicely caramelized edges. And the cake. Well, this cake is deliciously flavorful, and no electric mixer is needed to make the batter. The ingredients are simply stirred together in a bowl, similar to how you make a muffin batter. The cake contains both all-purpose flour and ground almonds, which adds a nice almond flavor and a slightly grainy texture. There is no butter in this recipe, instead a combination of oil, yogurt, and eggs are used which results in a moist and dense textured cake. There are many varieties of plums in the world. Some are good for eating fresh while others come into their own when used to make jams or in sweet and savory dishes. 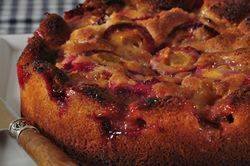 The two that I use in this recipe are either the Italian Prune Plum or the Red Plum. The Italian Prune Plum is my favorite. It is fairly small in size with a oval or egg shape. Its thin skin is smooth with a pretty blue, almost purplish color that is covered with a slivery grey bloom. Once you cut into its yellowy green dense flesh you will find it tastes sweet, with a hint of tanginess. The Red Plum is a fairly large plum with a bright red skin with a juicy yellow colored flesh. It has a nice tanginess which makes it perfect for eating as well as for baking. To cut plums, first, with a sharp knife, cut the plum in half by following the natural crease in the plum's skin. Then, holding one half of the plum, gently twist the other half. The plum should easily fall into two halves so the pit can be removed. As I mentioned above, this cake contains ground almonds. You can either buy almond meal/flour or else you can make your own by placing whole or sliced almonds in your food processor and processing them until finely ground. Almond meal/flour can be found at some grocery stores or else in specialty food stores, health food stores, or online. Plum Coffee Cake: Preheat your oven to 375 degrees F (190 degrees C) and place the oven rack in the center of the oven. Butter an 8 inch (20 cm) spring form pan. (Alternatively spray pan with non stick vegetable/flour spray.) Line the bottom of the pan with parchment paper. In a large bowl, stir or whisk together the flour, ground almonds, baking powder and salt. In another large bowl, stir or whisk together the eggs, oil, yogurt, orange or lemon zest (if using), and vanilla extract. Stir in the sugar. Add the wet ingredients to the dry flour mixture. Stir until just combined. Scrape the batter into the prepared pan and evenly arrange the halved plums on top of the batter, flesh side facing up. Sprinkle with the brown sugar. Bake in preheated oven for about 45 to 55 minutes or until a toothpick inserted into the center of the cake comes out clean. Remove from oven and place on a wire rack to cool. You can serve this cake with a little honey drizzled over the top or with a dollop of whipped cream, ice cream, or lightly sweetened yogurt. Makes one - 8 inch (20 cm) cake.